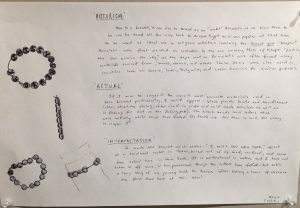 In this post I am simply uploading a photo of an assignment today in class along with a brief of an object I was asked to bring in that I personally identify with in some form. I chose a bracelet that had some significance to me. Here are the photos I took in class along with a brief explanation below highlighting its: historical, actual, and interpretive background. Apologies for this being an hour or so late- I just arrived home shortly and realized this was due at 3:50PM and not midnight. Here it goes! Historical- This is a bracelet, it can also be termed as an “armlet.” Bracelets as we know them to be, can be traced all the way back to Ancient Egypt as it was popular at that time to be used as ritual use in religious activities involving the Scarab god; “Khepri.” Bracelets were first created as reminders to the one wearing them of Khepri “pushing the sun across the sky,” as the days went on. Bracelets were often formed using materials sourced from: bones, stones, and woods. These items were also used in countries such as: Greece, India, Bulgaria, and Latin America for similar purposes. 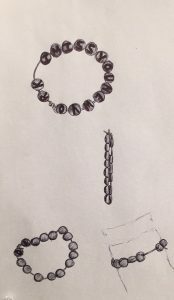 Actual- If I were to suggest the closest most accurate materials used in this bracelet particularly, I would suppose: black plastic beads and monofilament (clear, stretchy string; often used in craft and self-made bracelets as well as in fishing for bait on the fishing pole). The black beads have letters that were initially white that have faded. The beads are less than an inch, the string is maybe five inches. Interpretation- I made this bracelet which states: “I MISS YOU NEW YORK,” whilst at a treatment center in Texas, bored out of my mind, confined, and away from school here in New York. It is motivational in nature and I have not taken it off since, it has persevered though the letters have faded; but tells a long story of my journey back to Parsons after taking a leave of absence my first time here at this school. 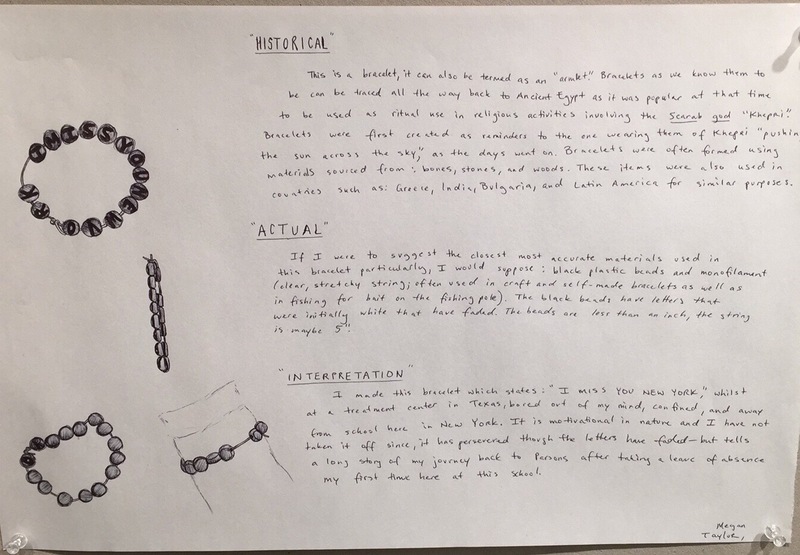 And finally, here is an up-close photo of my sketches of the bracelet at various angles.